Woke up today in the 21st century and was able to travel back a billion years or so before getting a hotel in Gillette, WY. First a word about Gillette. There may be some nice neighborhoods hidden in this town, but if so they are well hidden. Our hotel is nice and so were the turkey hotdogs and mashed potatoes we microwaved for dinner. Add some chicken salad and it was heaven. But Gillette is a rough and tumble looking place in a dusty corner of I90. Gillette supposedly is doing well (it is known as the energy capital due to their coal, oil, and natural gas resources). But the dough is not being spent on coffee houses and art galleries. The drive here though was amazing. It started with a pancake breakfast and buffalo patty for breakfast followed by a quick swim in the KOA pool. We hit the road around 10:30 feeling refreshed and ready for adventure. After a pit stop at a grocery store in Grey Bull we came across a small brown sign at a gravel road intersection. The sign listed several points of interest including “dinosaur tracks 5 miles.” After a quick deliberation we were off driving on a gravel road through BLM land. BLM lands is shorthand for “whatever the heck you want to do here is fine.” You can camp anywhere you want. You can also graze a herd of cattle, dig for fossils, or ride a horse/ ATV/ elephant whatever and wherever you want. The three of us ventured deep into this unregulated WY landscape on a very narrow and winding road. 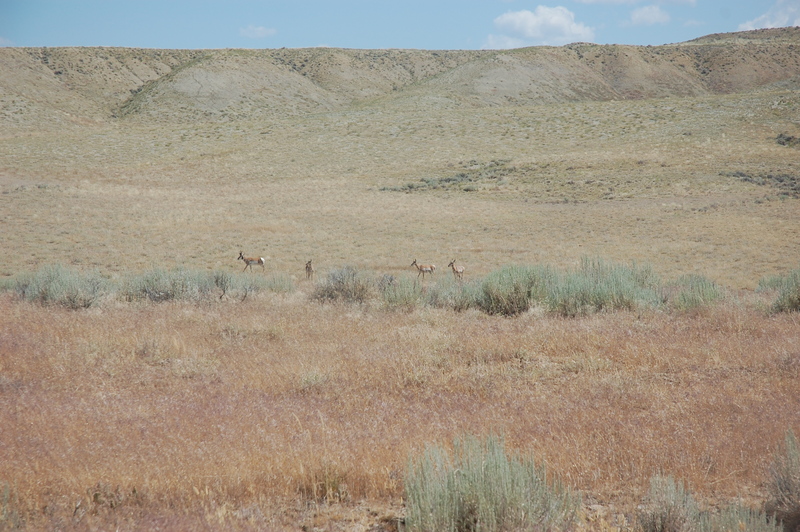 We saw several antelope and one truck parked in the sage brush. After 5 miles we came across a pavilion and parking lot that held one truck with a large family spilling out. More surprising was an outhouse and several plaques describing the find. 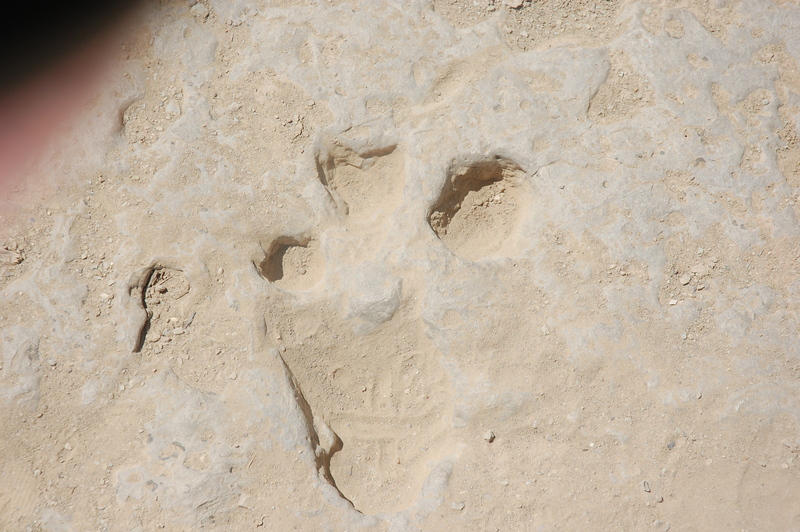 In 1997 a group of elderly explorers came across what was later confirmed as dinosaur tracks. The smiling faces of this group looked back at me at the sign which also described their finding as turning local archaeological history on its ear. 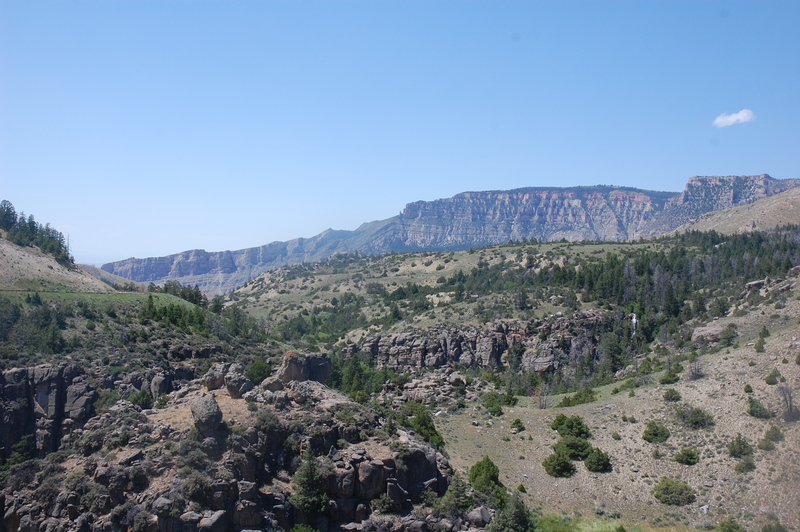 Prior to their discovery, it was assumed that this part of WY was underneath a great sea. Now they believe that it made up a type of beach when WY, some 169 million years ago, was much closer to the equator. A short trail led to the tracks which were fossilized and there was no barrier preventing us from us touching their foot (?) prints. Another sign even said we were free to look for and collect fossils. Henna found a 168 million year shrimp fossil (which was later confirmed). Henna also caught several grasshoppers and this is what she talked about most on our drive back to the paved road. Our next stop on our makeshift archaelogical tour was the Big Horn Valley. Geological forces I only vaguely understand resulted in a lot of very old rock being thrown up. Luckily the WY highway department puts wonderful signs up telling how old these rocks are. They ranged from being 70 million to 1.2 billion years old. The road is steep and incredibly beautiful and, just to add a higher degree of difficulty, cuts through ranches with sheep and cows hanging out by the side of the road. Maybe they were hitch hiking away from the ranch (I think you would agree that that would be a good choice for them). We left the car often to take several short hikes into this wonderland of striking rocks, buttes, and endless prarie grass. This road eventually led us to I90 and the hotel room I write this from. Tomorrow we hope to camp in Custer State Park, SD. 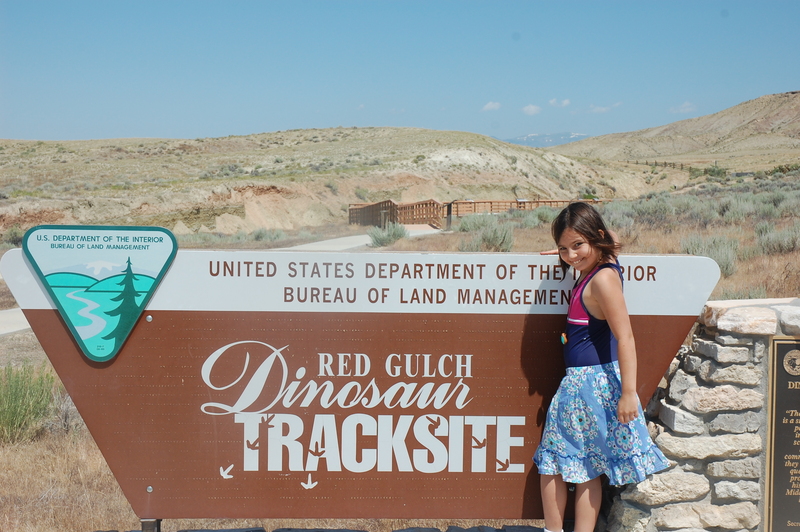 This entry was posted in Cowboy West, Ramblings and tagged Big Horn Mountain, Gillete, Red Gulch Dinosaur Tracks, Wyoming by hennacornoelidays. Bookmark the permalink.